A simple explanation of how it works. The riders must qualify for the Championships; they practice; raise money for travel and their horses’ transportation; and they have to have their communities support. See below for information on how to help. Bridget Strang of Carbondale coached the RFHPC Show Jumpers. Her sister Laurie Strang Cunningham was also there coaching for Tahquitz. Captain Francesca and Hazel with two team mates from the Arapahoe Hunt Pony Club in Denver. Q. What was most exciting part of your trip? From Olivia- "I think that the most exciting part about arriving at the Kentucky Horse Park was seeing how massive and beautiful the park is and knowing that we would be riding and stabling there for the next week or so. To set up our horses’ stalls and our equipment and tackroom felt like we were making our little home away from home. 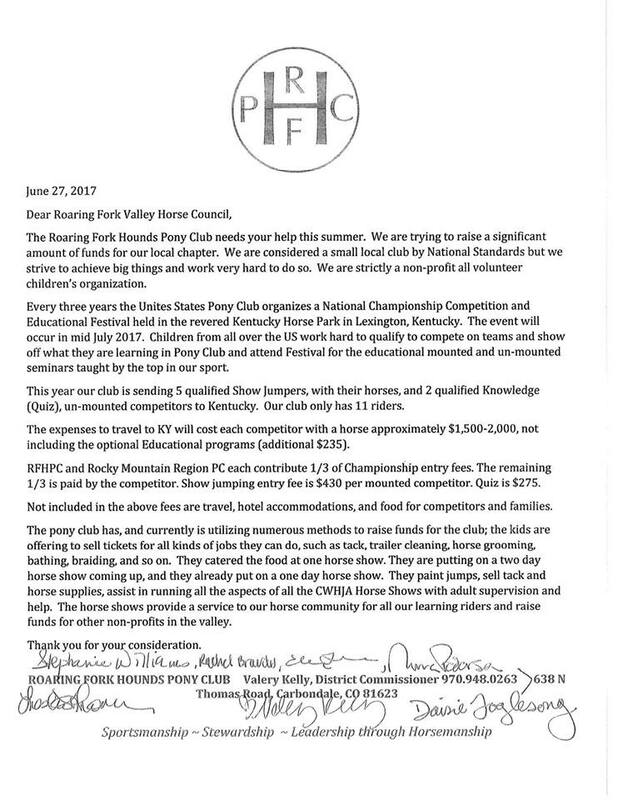 We left a bit of the RFHPC in the well-known, national horse center!" From Francesca- "My most exciting moment was when I got to the event, and as we were exploring and going around the Kentucky Horse Park and saw everything that was there! " Wren- "I am very thankful to have had this wonderful opportunity to compete at the Kentucky Horse Park in Pony Club Championships. Our whole team learned a lot and I really enjoyed the experience." Q. Were you nervous – on a scale of 1-5 ? Five being the most nervous. Wren- How nervous ? " I would say a 1." Q. What are you most proud about now that it is over? Olivia – “ I think that I was proud of how I rode during competition. We did not have the opportunity to ride in the rings prior to competition. On the day before the competition started, we hacked on a grassy track that circled the dressage complex. The next day we went straight into the show ring after a little warm up. I was pleasantly surprised as to how well Wonder, the horse I had the opportunity to take with me to KY, took to the new environment and how well he went around in the show ring. " Wren- "I think that I am most proud of having no individual faults throughout the whole competition in both riding and Horse Management. I was clear in all five of the show jumping rounds and 3rd in the equitation. I am very grateful to all the generous people who sponsored all of our clubs competitors and helped make it possible for us to compete." Coach Bridget Strang drove the horses from Colorado to Kentucky and they were arrive back home again safely yesterday. Four parents on the trip shared duties of chaperoning the kids, feeding them, and driving them to the barn by 6 AM every day. We also shared the duties of care of the horses (Setting water buckets, mucking stalls, walking horses, etc) before and after Champs. Pony Club relies on the help of volunteers to run every event, so we helped build jump courses, and timed and announced during the competition. To end this story, my thanks go to Valery Kelly for helping me get the names of the riders and competitors correct and their beautiful horses. 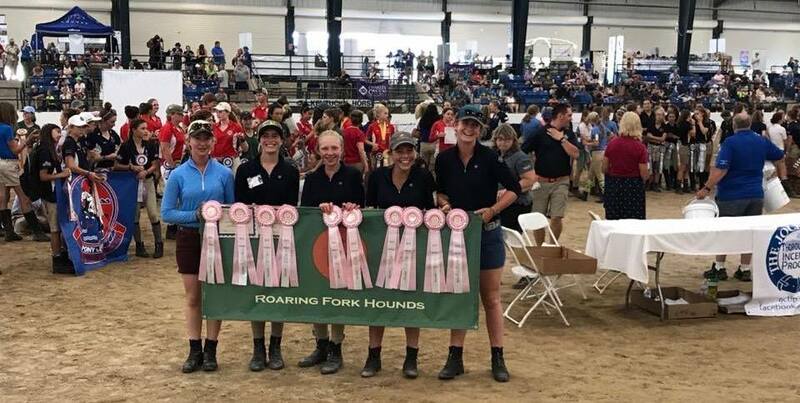 As the days go by, we hope to add more depth to this story about a group of kids from our valley who went to the largest horse park in the United States and came home winners! We are still raising money so please help! I am attaching their letter to this report. Please click here to read letter.